Buyers of Mercedes-Benz cars in Xi'an, capital of Northwest China's Shaanxi Province, flocked to a 4S dealership on Wednesday for refunds of financial service fees, which were called foul by regulators following an investigation of a high-profile dispute between the dealership and a customer over an oil leaking car. Some angry buyers said that they were induced to apply for auto loans as the salesmen said that this method of payment could save them money. But when they came to pick up their vehicles at the dealership, they were forced to pay the so-called "financial service fee," which the consumer surnamed Liu in the high-profile case was also compelled to pay. They couldn't get their cars otherwise. Lizhixing, the involved dealership in Xi'an, was packed with buyers trying to get refunds on Wednesday. Among them, a buyer surnamed Liu told the Global Times on Wednesday that people were told to register first, with no specific solutions given. Liu, who bought a Mercedes-Benz 350 with a loan of 270,000 yuan ($40,391) was charged a 4 percent financial service fee, said he realized that he had put too much trust in famous brands like Mercedes-Benz and neglected to protect his legal rights. "Many illegal and unregulated forms of misconduct were exposed this time," Liu said. "I was treated unfairly," said a buyer surnamed Zhu who was also waiting to register for a refund, saying she was particularly angry after she found she was charged a 5 percent fee, higher than other buyers who paid 3 percent or 4 percent. On Tuesday night, Lizhixing agreed to refund the financial service fee charged to Liu, who bought the oil-leaking car, in the compensation deal. The Shaanxi Administration for Market Regulation said Wednesday that the regulator was launching inspections into the ramifications of "forced payment of auto financial service fees." The China Consumers Association said on Wednesday that auto purchasing financial service fees should be marked clearly and illegal behavior including coercive trade should be banned. 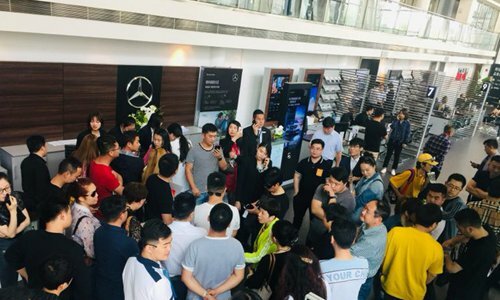 A sales consultant at the Mercedes-Benz booth at the Shanghai Auto Show, who asked to remain anonymous, told the Global Times on Wednesday, the second day of the auto show's media day, that the local 4S dealership in Xi'an was responsible for charging customers the financial service fees without informing them in advance, which is not in accordance with the norm. "Customers can choose not to use these services," he added. "The awareness of sales and after-sales services is really different from person to person, and that's also true of other auto brands." The backlash could take a toll on Mercedes-Benz's brand image, said Wang Danqing, a partner with Beijing-based ACME consultancy. "They need to improve their services, even though they still enjoy a good reputation in China." Feng Shiming, executive director of Menutor Consulting Shanghai, told the Global Times at the auto show on Tuesday that the case will be a good opportunity for Mercedes-Benz to rethink its product quality and the management of its dealerships, which are charging the highest fees in terms of financial services relative to other auto brands. "The dealership model is like a tumor. If it isn't treated in a timely manner, it will metastasize and the brand might collapse," said Feng.